Find out where you stand online with a comprehensive review of your web presence. Our assessment explores your website, social, pay-per-click, and direct marketing efforts and provides a detailed report with actionable recommendations. Want to have a chat about an Online Performance Assessment? Our team are here to help. The Perfect Option When . . .
A huge number of variables influence your success online, so it’s not surprising that many vet practices aren’t sure how to get started. Our Online Performance Assessment is a fantastic starting point. It not ony shows where you stand currently, but gives you actionable recommendations for how to improve. The expert analysis and recommendations included in the Online Performance Assessment come with absolutely no strings attached. The suggestions can be implemented by your preferred technical, or by the Pet Pack team (totally optional). A trial and error approach to online marketing can be frustrating and ineffecient, especially due to the complex inter-relations between online marketing channels. An Online Performance Assessment helps to identify the key issues and opportunities influencing your online effectiveness. Choosing an online marketing partner can be a tough decision. At Pet Pack we want you to be 100% comfortable before engaging any of our on-going services. 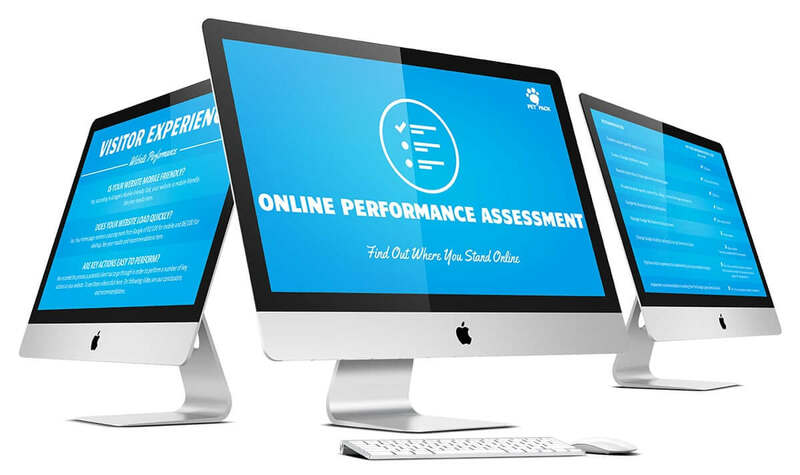 The Online Performance Assessment is a fantastic way to see if we’re the right agency for you and your practice. Get An Expert Assessment That Includes . . .
Hi Pet Pack team could you please send information about online performance assessment pricing?